Oh salmon and asparagus lovers, make this for dinner TO-NIGHT. It was insanely delicious and very easy. 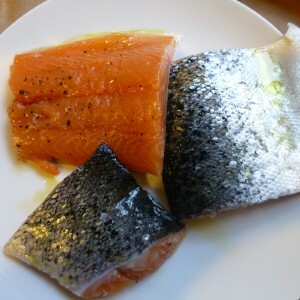 As often as I crave salmon, I find that I don’t buy it or cook it enough. It’s not a favorite meal of my husband or son (even though the husband will eat it). It seems too finicky and expensive to do for group entertaining (although I love to serve it at smaller dinner parties.) So I often find myself passing it by in the grocery store, until one day, I just must have it and cook it for myself. My comfort food. I always buy salmon filet with the skin on. Go for wild-caught Pacific salmon if you can find it. 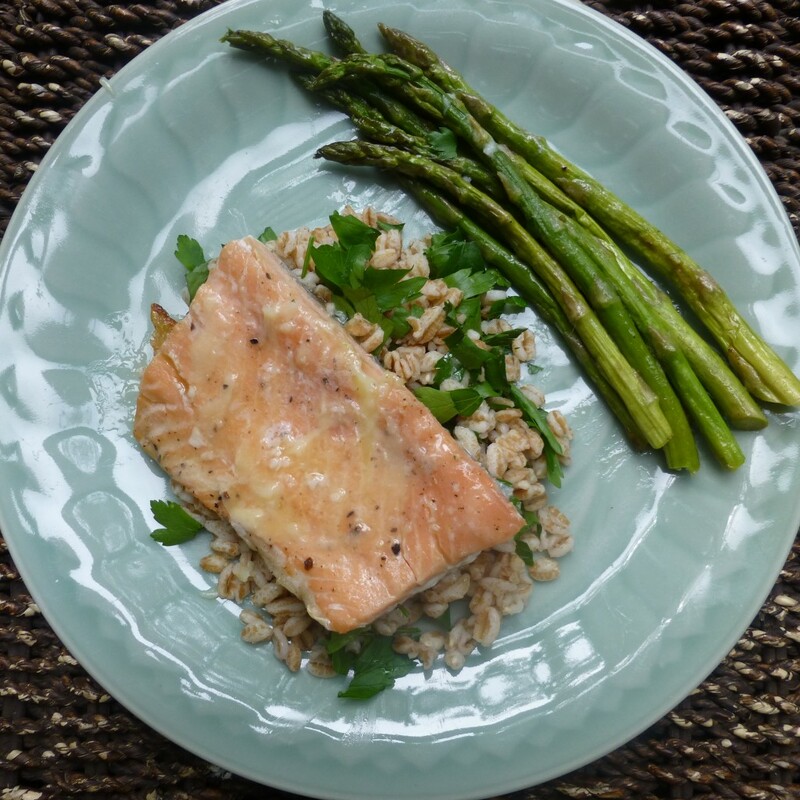 If your store only has Atlantic farm-raised salmon, look for pink-fleshed, firm filets, and go ahead and be persnickety–go to the fish counter and ask the seafood guy or gal a few questions. Take a sniff. Fish should smell like the sea (a little bit briny) but not at all fishy. I cut these salmon filets myself from one large piece of salmon. (That is why one is smaller than the other three.) You can have your fish guy cut it for you or get all center-cut pieces for more expense. Preheat your grill (medium high heat for gas or about 350°). Make sure grill grates are clean and brush them with oil so fish does not stick. Brush fillets lightly on both sides with extra virgin olive oil, then season both flesh and skin sides with salt and pepper. Hint: once the albumen (the white stuff that is a protein in salmon) shows on the flesh surface that means it’s almost done. 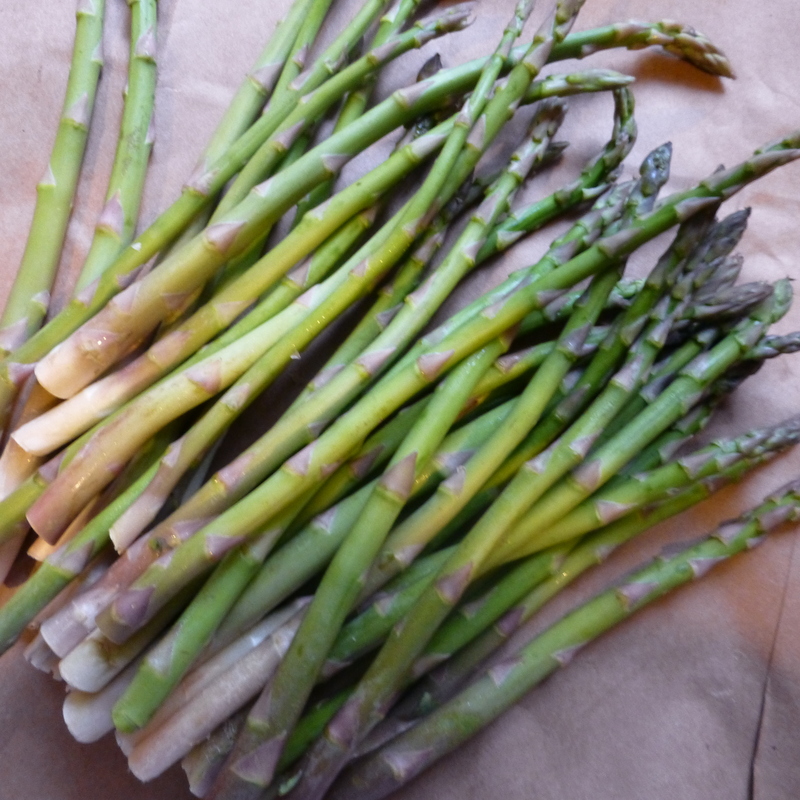 Toss trimmed asparagus with olive oil and season with kosher salt. Place asparagus perpendicular directly on the oiled grill rack (or alternatively place on a grill pan so they don’t go through the grate ) and grill until blistered and tender, 3 to 5 minutes, turning occasionally. This sauce, as simple as it is, was out of this world. It elevates the entire dish and you will want it on everything. It’s a bit like a citrusy hollandaise but without the egg yolks. Thank you, Ian Knauer, for this killer sauce. Purée garlic clove with lime juice, salt, and pepper in a blender until smooth. With motor running, add melted butter and blend until emulsified, about 30 seconds. Lime butter sauce can be made 1 day ahead and chilled, covered. Stir before using. I made the quinoa the night before, following the package directions. Cook the quinoa in 2 and 1/4 to 2 and 1/2 cups fresh water, covered, until all of the water is absorbed. Add pinch of kosher salt to taste. (You can also cook the quinoa in chicken or vegetable stock if you desire a more robust taste.) At this point you can refrigerate the quinoa over night and reheat it before serving. Scoop the cooked quinoa into a bowl and add the chopped mint and parsley. Toss. Before plating with the grilled salmon and asparagus, add 1/4 C. of the warm Lime-Butter Sauce to the quinoa. Toss. Place a scoop of warm quinoa and herb mixture on plate. Top with grilled salmon filet. Serve with grilled asparagus on the side. 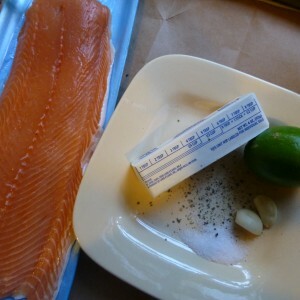 Spoon Lime-Butter Sauce over the salmon and enjoy! (Rebecca’s Note: Here’s a marriage hint. If you love under-done fish (I would call it “just-right”) and your husband loves over-done fish (he would call it “not raw”), remember that you can always finish it in the oven or on stove-top.